Although I am not a very acute observer of football, when a passing side plays well I find it very aesthetically pleasing. I like to watch teams which are attacking and positive. And they do not get any more attacking and positive than Marcelo Bielsa. When a Bielsa side plays at maximum capacity, it puts teams like Barcelona and Spain to shame. I sometimes find myself yawning when I watch that type of tiki-taka football. Bielsa's teams are well-drilled and pass the ball well, but it is ratcheted up to 500 miles per hour. Every single player presses the opposition and aims to retrieve the ball. His sides play with three defenders and even their role is offensive. The objective is to score more goals than the opposition, regardless of who the opponent is. Bielsa has his own philosophy and it will never be revised. You might call it inflexible and predictable, but for football purists it is a manna from heaven. Even if you call it reckless, you can't argue that it also gets results. His eccentricities only make him more endearing. With a pair of gold-rimmed glasses dangling from the holders, he resembles a crochety professor or your favourite uncle. He crouches on the manager's dug-out, intently peering out onto the pitch. He trudges through the dug-out, endlessly analysing the ways he can win the game. Indeed, he is such an astute tactician that he can change the course of the match through a couple of substitutions. Bielsa is from a football-mad town in Argentina called Rosario. The two teams are either Rosario Central and Newell's Old Boys. His father was a Rosario Central and Bielsa, being a contrarian, decided to ardently support Newell's. His obsessive nature already flowered in early childhood. During one of several military dictatorships in Argentina, the police ordered a group of kids to stop playing a obstructive game of football in the street. They took his ball away. Bielsa stated that if the ball went, he went. He was arrested and his ball eventually returned, because he simply would not stop carping on about it. As we shall see, Bielsa is a very principled man. After a brief playing career in Newell's, he took over the club as manager and led them to a championship trophy. He even took them to the final of the Copa Libertadores (the equivalent of the Champion's League). He has since acquired a legendary status at the club; one of the stadium's stands is named after him. Only a couple of years ago, the fans were being called upon to vote for a new president and Bielsa flew in and was the first person in the cue to vote. His career is tainted by one regrettable episode, as Argentina manager the 2002 world cup. It is clear that he 'over did' the preparations. He assiduously overtrained the squad and they literally could only limp onto the pitch. Argentina crashed out in the first round after heading into the tournament as hot favourites. He remains a divisive figure in Argentina to this day, though he acquired a God-like status in Chile after taking over the reins of the national team. It was footballing renaissance. He also instilled a type of high-pressing game that has now become emblematic of all Chilean football. When he was their manager, he even lived in a little hut in the stadium's ground. Of course, he was accompanied by his encyclopedic library of football videos, which he methodically analyses. True to his principles, Bielsa left Chile after some disgusting political manoeuvring. The president, Sebastián Pinera, decided that he simply must go. 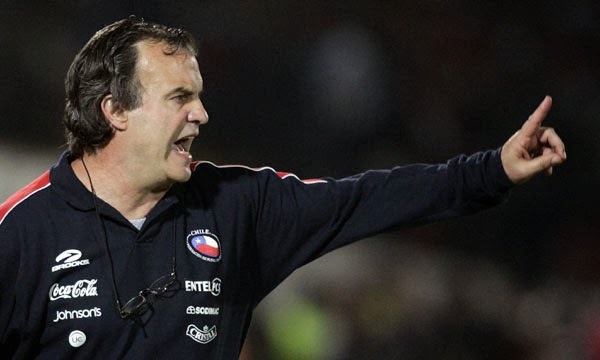 Bielsa stated that he would leave if his contractor was replaced, Harold-Mayne Nichols. He followed through on this threat when Pinera installed a different candidate. Later, he moved to the quirky club Athletic Bilbao. As he was now playing European football, I managed to see two of their games. In the first game, against Real Zaragoza, they managed to win with ten men. The squad had already grasped his methods - they can take a while to sink in - and were climbing up the table. My dad and I even tracked his hotel, but he didn't appear to be inside and it appeared to be a fenced private residence. It could be called stalking, but we were assured that he was receptive to visitors! The second game was the best football match I have ever been to in my life. It was a Europa Cup tie between Bilbao and Manchester United, in Manchester. Bilbao swept Manchester aside with ease. It was a footballing masterclass. Man Untd. were left very beleaguered. His methods have also forged a generation of acolytes. Gerardo Martino, the current manager of Barcelona, is an avowed disciple. So is Mauricio Pochetinno, manager of Southampton. And the current manager of Chile, Jorge Sampaoli. All these managers have made their way through Newell's Old Boys youth system. Pepe Guardiola has expressed his admiration, citing him as the best manager alive.